Ferruccio Lamborghini was a manufacturer of air conditioning and tractors. Legend tells he bought a Ferrari but was not satisfied with it. When his complaints were dismissed, he vowed to make a better car. In 1949 he began producing farm tractors with small diesel engines. The first Lamborghini automobile was shown in 1963. 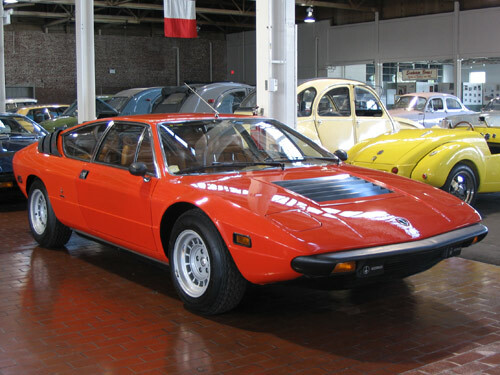 The Urraco p300 you see here was introduced at the November 1974 Turin Auto Show. 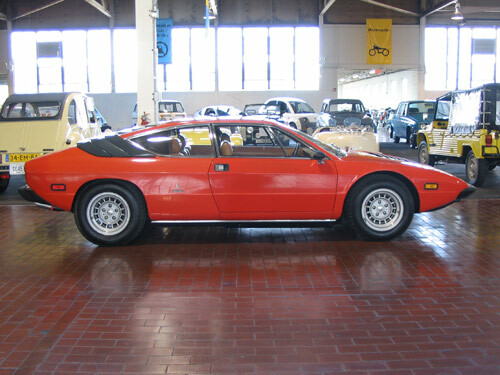 It was designed by Marcello Gandini and built by Bertone. The floor is incorporated into the all-steel body. The engine is mid-mounted, v-8 90 degrees, light-alloy and aluminum block with gearbox and differential built in the same block and pressed-in liners. This 2 + 2 seater coupe can achieve 0-60 mph in 5.6 seconds. The Urraco was exceptional in terms of aesthetics and performance.